Unlike the others, Peter did not come up with his alter ego, The Catman, right away. He went through many variations, and the make-up has continued to evolve ever since. Picture 1 shows Peter as he had just joined the band in late 1972. Like Paul and Gene he wore white face make-up, with painted eyebrows and eye shadow. It is hard to make out what color the eye shadow actually is, but it looks like a blue or purple color. Picture 2 is from January 1973, when Ace had just joined. Peters make-up resembles early Alice Cooper. But then Peter started to put his Catman persona together. Picture 3 shows an early variation, with the black/silver nose we know today, but otherwise nothing resembles the finished design. Funnily enough he seemed to drop the black and silver paint on the nose, and did an entirely black cat nose for a while. Picture 4 is from one of the bands performances in the summer of 1973. He had now added a number of thin whiskers, pointing slightly upwards. The make-up around the eyes was now a round shape, with two points. There were also a differently colored area around each eye... again it's hard to make out the color, and I can't say if it was green, as it would become later on, already at this point. For the cover of "KISS" Peter let a professional make-up artist put his make-up on, which made an interesting variation. The design around the eyes were still roundish, still with a few points. The black and silver design on the nose is back, while there were only two large whiskers on Peter's cheeks. The whiskers were now three-parted, and pointed slightly downwards. Peter's lips were now painted a bright red (like Paul's), here with points out on the cheeks, one down to his chin, and one very thin one up towards the nose. Picture 6 was taken late in 1973, for a promotional appearance where KISS signed a record deal, with Neil Bogart also in full make-up. Peter's nose was again entirely black, while the whiskers were now two-parted, and were again pointing upwards. But the designs around the eyes were now roughly the same shape, as the finished design. Picture 7 and 8 are both from January 1974, and shows that Peter was rather indecisive about his look in this period. The look on the others in picture 7 would indicate that this was taken before picture 8, but video footage from February 1974, shows Peter again wearing make-up very similar to the make-up on picture 7. Peter's nose was still black, but now Peter had added a black "split-lip" design under the nose. The two whiskers were now in one piece, while still pointing upwards. The design around the eyes was slightly grayish, and a square shape. On picture 8 Peter's design around the eyes had finally become, what we know today. A slightly diamond-like shape, with a point upwards (under the hair), and two in the corner of each eye. The nose was again black and silver, but the "split-lip" part was gone again. Instead there was a red point coming up from the upper lip, like on the cover of "KISS". The whiskers was now broader, and pointed slightly downwards. Later in 1974, Peter finally came up with the look we know today, as can be seen in picture 9. The black and silver nose, with the "split-lip" design, and two larger whiskers. This make-up would still be refined a few more times... first in early 1976 (picture 10), when the two lower whiskers was joined up with the "split-lip" under the nose, and later in 1976 (first seen in the Paul Lynde's Halloween Special) green eye shadow over the eyes (picture 11). This was the look for Peter until he left KISS in early 1980. Peter put on his make-up again for the release of his mini-CD "Criss" in 1993 (picture 12). But he didn't get it quite right (or was it because KISS owned the right to the original make-up?). The shape of the design around the eyes was more squarish, the nose was entirely silver, and both whiskers were joined up to the "split-lip" under the nose. First the green area didn't extend under the eyes, but ended just at the lower eyelid, which was now painted black (take a close look at picture 11, where it's easy to see that the lower eyelid was green in 1977. For the European leg of the tour, in November and December 1996, Peter had added a thin black line around the lips, as seen in picture 15 (if you look carefully). This was dropped soon after, however. A final change was made on the final leg of the Farewell tour in September and October 2000. Peter added a teardrop under his right eye (as you can see on picture 16, with a close-up of the tear on 17). Fans disagreed over the meaning of the tear, some thinking it signaled that the Catman were sad the tour (and KISS) was at an end, while other figured it signaled that Peter was sad that the band couldn't get to an agreement about the final part of the tour, a rumor that was going around at the time. This was only speculation, though... as usual KISS were tightlipped about what really went on behind the scenes!! There were two additional Catmen!!! 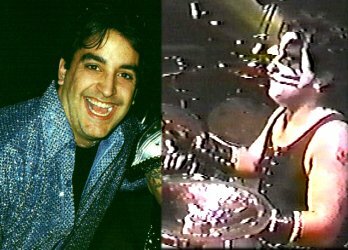 It has often been rumored that other people stood in for Peter Criss during the '70's, whenever Peter weren't able to perform, or didn't show up! This was always strongly denied by KISS, who says that they never put anybody else in the Catman make-up and costume in the '70's! But after the reunion in 1996, it has happened twice! First time was on April 5th 1997 in Columbus, GA., USA. Peter started having problems with his arms during the long and demanding tour, and couldn't perform at the Columbus show! Peter's drumtech Eddie Kanon jumped into the Catman costume and make-up! Eddie hadn't had a chance to rehearse with the band, so it sounded a bit off from time to time, but he really did a great job at such short notice. The pictures above shows Eddie without make-up (on the left! ), and on the right Eddie in concert during the Columbus show! Second time came recently, when KISS and Peter couldn't reach an agreement about the last part of the Farewell tour in Japan and Australia. If rumors are correct, Peter were unhappy that he had been offered less money than Ace to do the tour and bowed out! KISS then hired their old drummer Eric Singer to come in and play the drums for that part of the tour. The decision were met with rather unhappy responses from the fans, not so much because of Eric, but more the fact that poor Eric had to wear the Catman make-up/costume, instead of something original! But it seems the decision had something to do with the contracts signed with the promoters... something about KISS has to deliver a show with the four original characters!! Picture A was the first published picture of Eric in the Catman get-up, which also were met with tons of hateful responses on the internet! Picture B (in the middle) is Eric in full costume at the first show in Yokohama, Japan, March 9th 2001. As you can see, the costume is identical with Peter's... Eric is also wearing the platform boots, but probably only because he's taking a bow for the audience. I doubt he also played with them!! Two other things you'll notice on this picture is that Eric is wearing a sweat band around each wrist, and that Eric's tattoos has mysteriously disappeared!!! This confused a lot of fans... did Eric have them removed for the tour??? Not so... when Eric toured with Alice Cooper in Europe in May 2001, the tattoos were back where they had always been! They had simply been covered with skin toned tape for the KISS shows! WHY? Well, that is a very good question!!! Picture C is not actually a photo, but a photomontage by talented artist Mike Rutherford, which shows what could have been: Eric Singer as The Hawk! The Hawk had originally been designed for Eric Carr in 1980, before The Fox came to be... but the original design were clumsy looking, and Eric Carr were extremely unhappy with it! 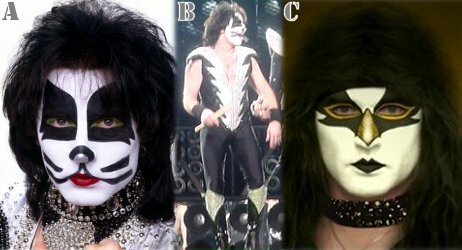 Eric Singer had joked several times, that he would be The Hawk because of his nose, and Mike Rutherford's artwork really shows how this could have been done... it certainly looks far better than Eric as the Catman in my opinion... but what do I know?? Many thanks to Jan Laursen for letting us use these pages. Die Seite von Fans f�r Fans! Hast Du irgendwelche Neuigkeiten? Schicke sie an News@kissnews.de, damit wir sie hier ver�ffentlichen! KISS NEWS ist eine private Website. Alle News sind als inoffiziell zu betrachten und nicht von KISS best�tigt (au�er ausdr�cklich angegeben).